Warning - There are satellites constantly monitoring 121.5 243.0 and 406 MHz and are designed to pick up the feeble signals from these survival radios. DO NOT Transmit on these frequencies unless you want to be visited by SAR personnel. Radio has been used as a way to call for help for many years. Although now discontinued 500 kHz was the international distress calling frequency for ships at sea. In modern times satellites monitor 121.5, 243 and 406 MHz. The early satellite systems gave a position, but the newer 406 MHz beacons transmit digital data about what kind of ship or plane is in trouble and possibly a GPS based location. In the case of someone behind or near enemy lines there is a problem with rescue radios that work in the clear. The enemy may hunt the survivor by direction finding his beacon. 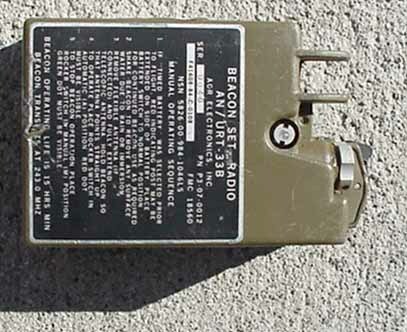 The enemy may capture a beacon transmitter and use it to lure a rescue team into a trap. In all other cases these problems do not exist. In some cases, like a pilot ejecting from a jet, you want the emergency beacon to turn on automatically. In other cases you want the survivor to turn on the beacon when they decide that's the thing to do. 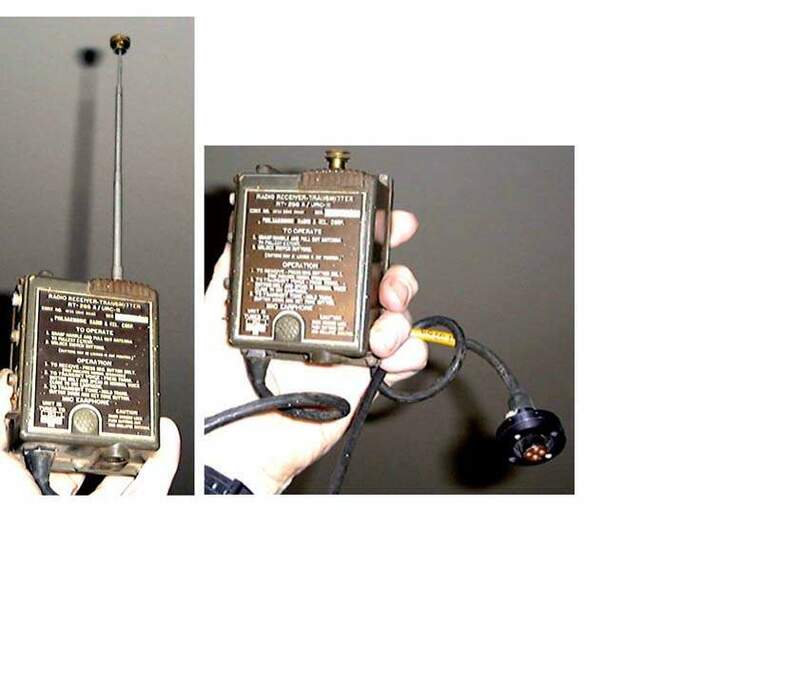 In the beginning they used Doppler to locate emergency beacons on 121.5 and 243 MHz. This service is scheduled to end next year on 1 Feb 2009. The current service is based on transmitters operating on 406.025 MHz using digital data including a transmitter serial number. Will there still be a requirement for mil aircraft to have a "guard channel" at 243 Mhz? What about civilian aircraft guarding 121.5 MHz? Argos is a unique worldwide location and data collection system dedicated to studying and protecting the environment. It's based on polar orbiting satellites and uses transmitters on 401.650 MHz that send digital data including a transmitter serial number. Mainly used for animals and environmental data like ocean buoys but also for expeditions and yacht racers. Based on the French Space Agency CNES. Animal transmitters are made by Sirtrack and others. For use on ships, they float. Simplified Voyage Data Recorder (SVDR) is and EPRIB. 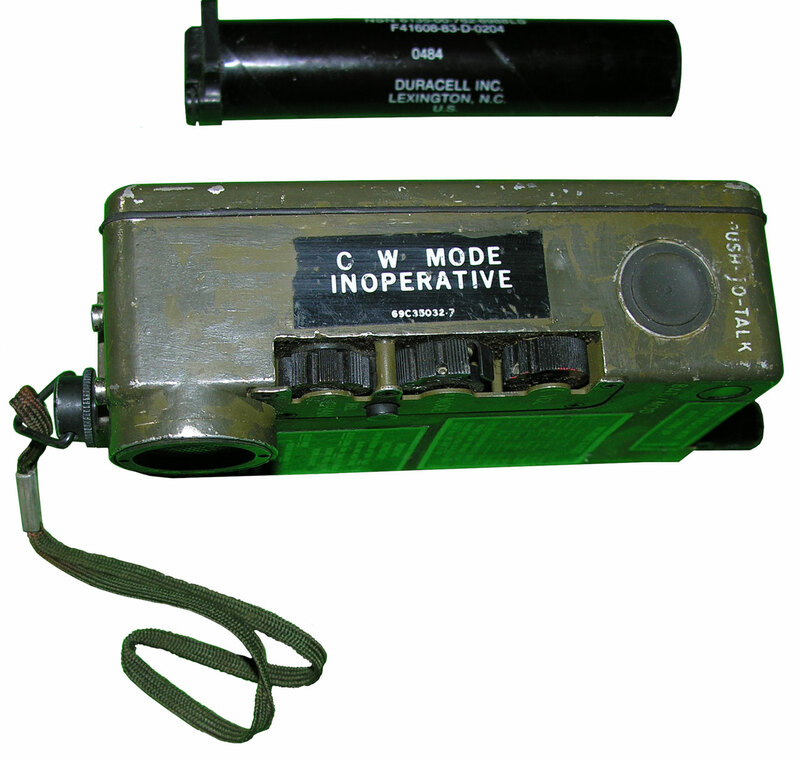 Civilian versions used by explorers, hikers &Etc. Military versions like the URT-44, PRC-112, C-SEL. 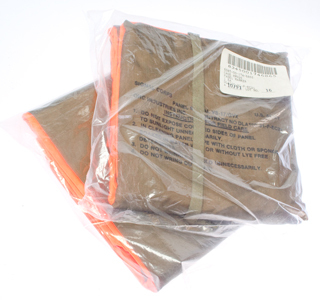 Used in aircraft. Often have a "G" switch to turn on if a crash. Also have manual On/Off switch. Some stowed for use after crash. Allows calling for help if boarded by pirates. Typically use Iridium satellite system. Used by hikers or explorers. These have very different capabilities and some may not be suitable if y our life is at stake. In the movie "Behind Enemy Lines" there a scene where the hero goes back to where the ejection seat landed and he gimmicks the beacon radio. But in reality the beacon radio stays with the guy on the parachute, it does not follow the seat. There are a number of ways that an aircraft survival radio might be used. 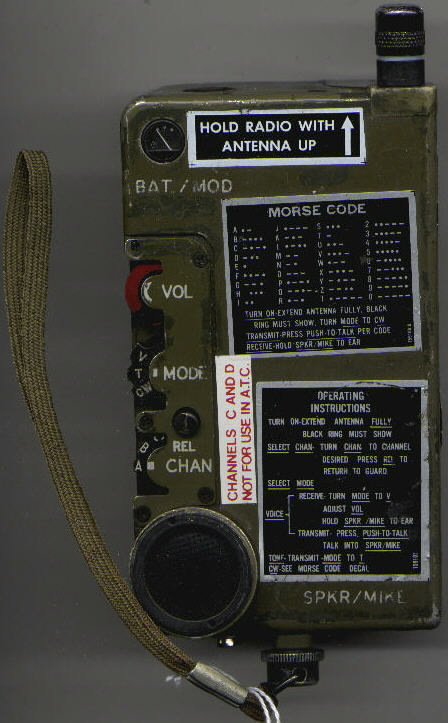 most of the radios below are designed to be stored in a pouch on a survival vest. 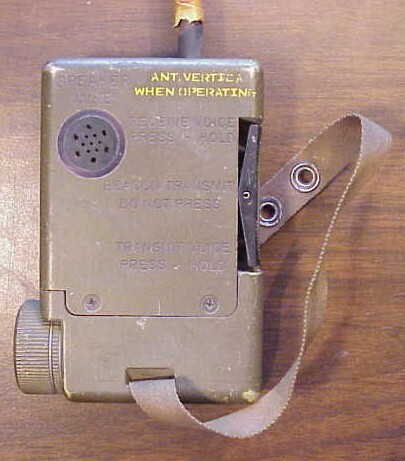 The radio would be activated after being on the ground either after a crash or after a parachute drop. some of the radios, like the URT-33 are part of an ejection seat and are automatically activated as soon as the seat moves. some of the radios may be part of an over water survival kit and would be activated when in a life raft. the next generation radios will have GPS receivers to broadcast to the SAR satellites the position and the identity of the radio. This appears to use the same 14.0 Volt Mercury BA-1568/U that is used on the PRC-90. These radios are part of the bail out kit that aircrew members carry. It is turned on by the user, not automatically like the URT-33. The improved PRC-90-2 survival transceiver is familiar to most military aviators as the rugged, hand-held survival radio that has saved the lives of thousands of downed pilots and crew members. 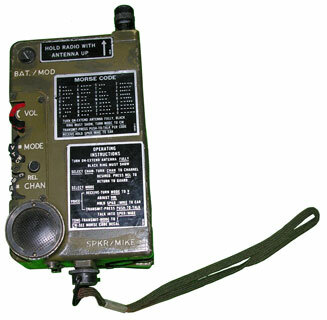 It has voice and beacon capability on the military distress frequency of 243.0 with voice Tx and Rx only on 282.8 MHz. 282.2 MHz is used by the Civil Air Patrol for ground - air coms with military aircraft during SAR operations. 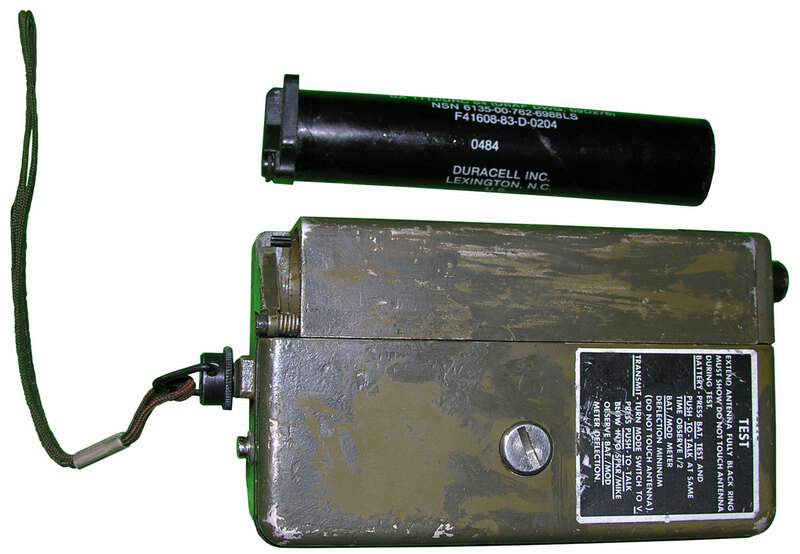 The PRC-106 is a derivative of the PRC-90-2 and provides both beacon and voice Tx/Rx capability on the civil and military distress frequencies of 121.5 and 243.0 MHz, but does not have the 282.2 MHz channel. The PRC-103 and PRC-195 are other derivatives of the PRC-90. This unit replaced the PRC-90. 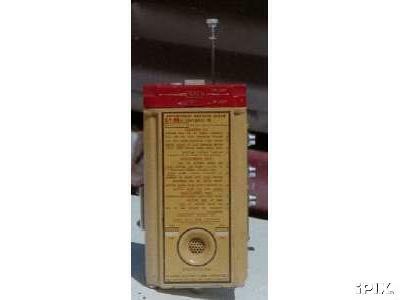 It is a synthesized radio that covers 225 to 400 MHz and has a transponder function to help rescuers locate the radio. My guess is that when the location mode is turned on the radio turns on and off at a rate depending on how far it is from the rescue aircraft giving the aircraft range to radio. The civilian and military have gone to the 406 MHz digital rescue radios that are supported by the SARSAT system. 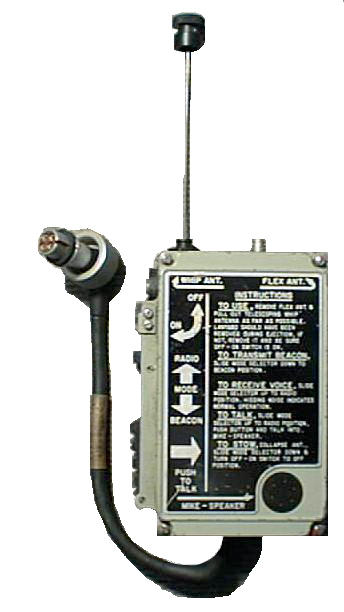 Major components to the AN/AYD-1 Personnel Locator System (PLS). PRC-112 with frequency of operation (225 to 300 MHz) and a personal ID number (actually the SARSAT data set). The AN/ARS-6(V) is the aircraft system that interoperates with the PRC-112 giving the pilot either bearing or bearing and distance to the survivor. 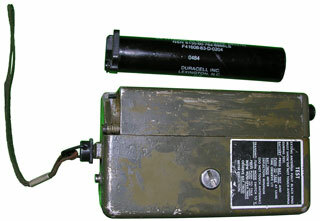 The PRC-112 has two fixed channels assigned to 121.5 and 243 MHz that can be used in either beacon mode or AM voice mode. It too uses a specialized BA-5312/U 3.4 AH battery instead of commonly available batteries, but there is an official battery adapter being developed by the government. There are a large number of variations on the PRC-112. The later ones have a built in GPS receiver to allow reporting position. 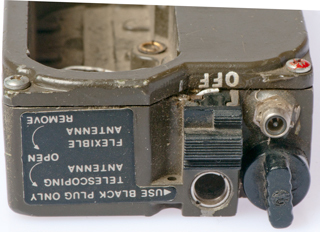 The design constraints for the PRC-112 are different than for a civilian survival radio in that the PRC-112 probably will be used behind or near enemy lines. I doubt that the AN/ARS-6(V) can be used with civilian 406 MHz beacons. If the PRC-112 is sending a SARSAT compliant digirtal message then it can be picked up by an enemy receiver, seems like a problem. Motorola - PRC-112 - was the origional contractor for the PRC-112 and General Dynamics has now taken over production. 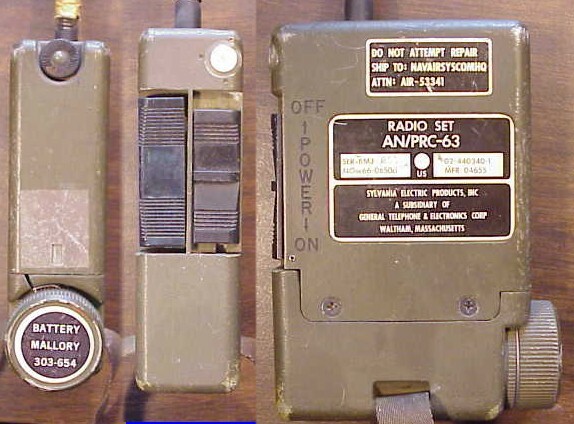 Operation Allied Force (OAF) deployment order on 17 February 1999 to the completion of OAF in June 1999 - "VMAQ-2 aircrews were not issued the latest survival radios (PRC-112) prior to arriving in theater due to a DOD wide shortage." 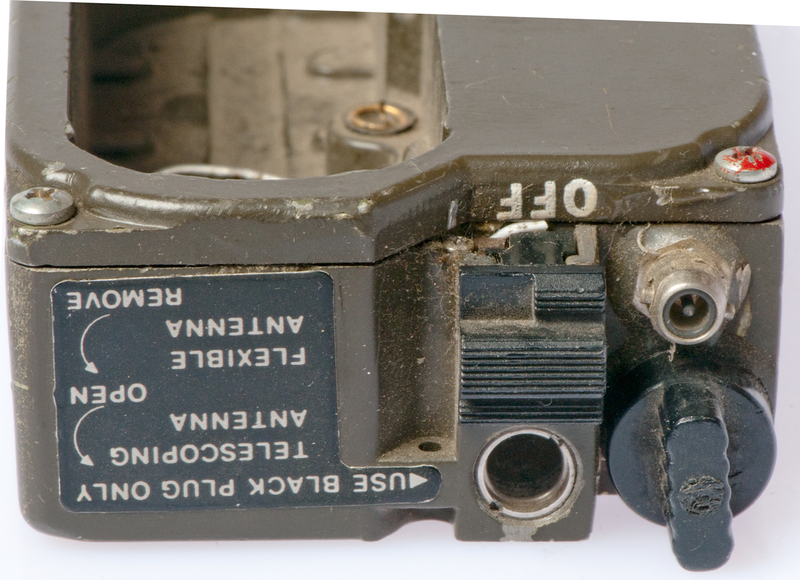 The CSEL will eventually replace the PRC-90, PRC-112, and the Hook 112 survival radios -- all of which are only capable of transmitting voice and in some cases data line of sight. Cubic Defense Systems - AN/ARS-6(V) Data Summary - 225 - 300 MHz both passive homing (RPC-90) and active transponding with PRC-112 for range. Beacons on 121.5, 243 and 406.025 MHz, voice on 121.5, 243 and 282.8 MHz and has a burilt in GPS position locating capability. 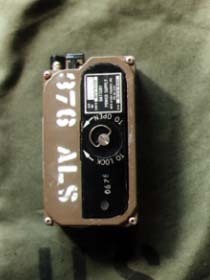 SAR radio for troops not forward deployed and recsue swimmers. The URT-140 is the ejection seat beacon only version of the PRC-149. Designed to run from a couple of ordinary "D" cell flashlight batteries or a sleeve holding a couple of "C" cells. There have been a number of reports about battery venting, sparking, etc. that has resulted in the development of a very special battery just for this radio. Also there's a problem when the radio is carried loose in a bag where it can get turned on accidently. A lockout clip has been designed as an add on fix. SARSAT Report 703-1 shows two Saft "D" cells LSH-20. Carried on the Viet Nam era Patrol Craft Fast (PCF). Covers the 225 to 285 MHz range using crystals. 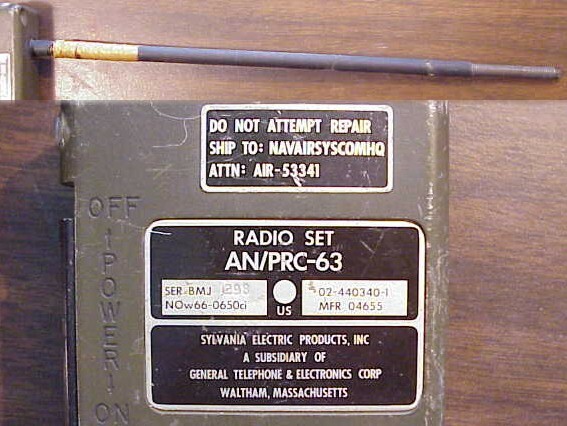 Rescue of Bat 21 Bravo (Wiki) - "The URC-64 survival radio was his most important survival item." PJs in Vietnam: The Story of Airrescue in Vietnam As Seen Through the Eyes of Pararescumen, SMSgt Robert L. LaPointe, USAF, Retired - photo caption on back dust jacket "It includes a survival vest, two URC-64 survival radios, GAU-5 rifle, hand grenades, M-79 grenade launcher, .45 pistol, and three quarts of water." Battery: BA-1113, aprox. 1" dia x 4-3/4"
In the above table I tried 2x, 3x and 4x the Crystal frequency, and 4x did work with an IF of 73 MHz. The x2 and x3 multipliers did not work (IF freq different for each channel), so I've used strike-through to mark them as non functional. Bottom: two male snap terminals for earphone (with magnet to silence speaker), 1/4-20 threaded socket (attaches to camera tripod), swing out battery holder. Normally turned on by the survivor, but optional kit to allows automatic operation when a lanyard is pulled, like in an ejection seat. 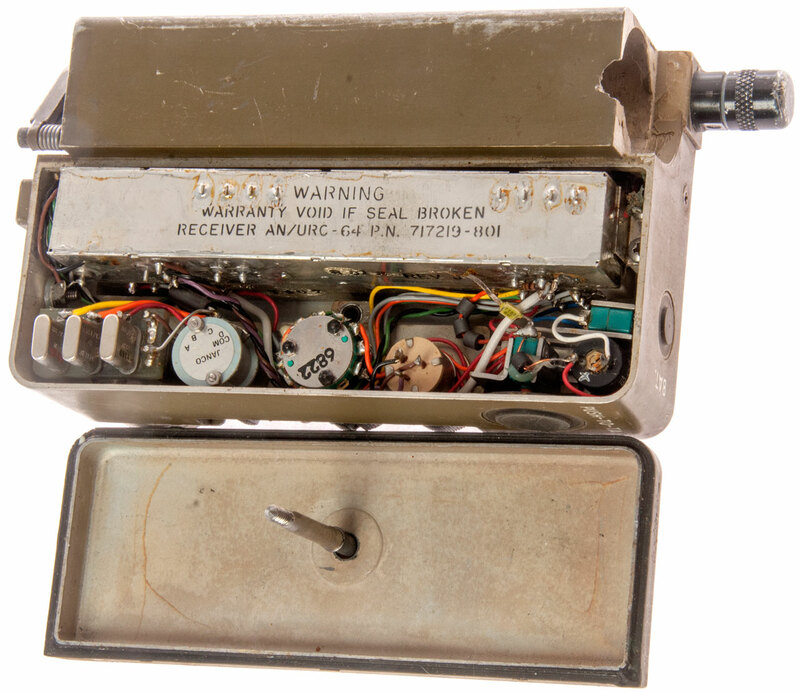 This is a Vietnam era survival beacon transmitter (it has no receive capability). 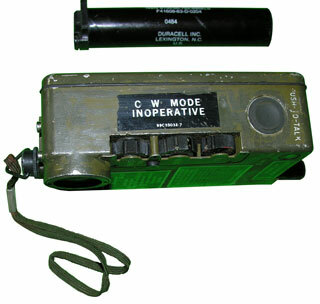 Commonly used in conjunction with the SDU-5/E Strobe light. Maybe featured in the movie "Behind Enemy Lines"? Featured in the book "The Rescue of Alpha Foxtrot 586" by Andrew C.A. Jampoler (Navy Institute Press). For use with AN/ARA-50 or AN/ARC-34 aircraft receivers. 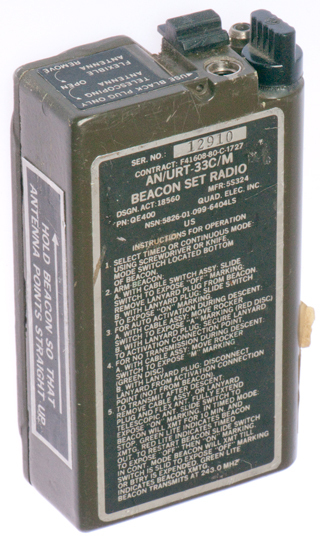 The rescue beacon will jam the frequency (121.5 or 243 MHz) so it's not usable for other purposes. 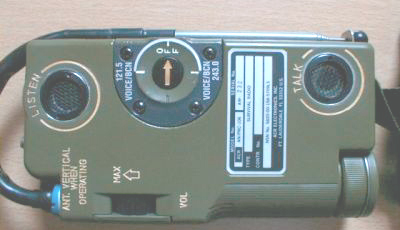 Note the PRC-90 has an alternate channel for voice communications so can be used even if 243 is active with a beacon. There are two possible antennas. The built-in telescoping antenna or the external flexable antenna. Only one antenna can be used at a time. The flexible antenna is deployed in ejection seats along with a lanyard that turns on the radio when the seat ejects. AN/URT-33C/M, 5826-01-099-6404 - A Magnet p/n A1-17-0672 added to actuation plug p/n A1-18-0921 forming automatic activation plug assembly p/n A3-06-0802 and a magnet p/n A1-17-0670 added to manual switch button p/n A1-18-0920 forming switch and magnet assembly p/n A3-06-0785. These radios are built into the ejection seat survival pack. They automatically are activated when the seat ejects. 243 MHz with a battery that has a flange and slides into a slot. This is a famous life boat rescue radio. Tx on 500khz and 8364 khz. Also see my CRT-1B Sonobuoy web page. "Cospas-Sarsat is a satellite system designed to provide distress alert and location data to assist search and rescue (SAR) operations, using spacecraft and ground facilities to detect and locate the signals of distress beacons operating on 406 Megahertz (MHz) or 121.5 MHz. The position of the distress and other related information is forwarded by the responsible Cospas-Sarsat Mission Control Center (MCC) to the appropriate SAR authorities. Its objective is to support all organizations in the world with responsibility for SAR operations, whether at sea, in the air or on land." Users of the 121.5/243 MHz beacons will have until 2009 to complete the switch over to 406 MHz beacons. Since 1982, more than 11,000 people have been rescued world wide with the assistance of the Cospas-Sarsat System. ACR TerraFix 406 Beacon has 2 models one with and one without builtin GPS. 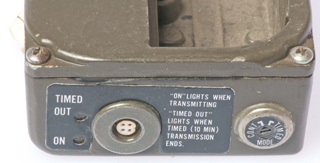 This is a personal strobe light typically carried by each aircrew member. Can use my battery adapter instead of the BA-1574/U Mercury battery. Uses two each BA-1328/U batteries, can substuite two AA cells that have a modification. Note an IR light stick can be attached to a short parachute cord and spun overhead making a "buzz saw" that's very visible to searching aircraft. 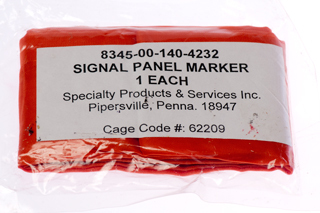 There are a number of standard panel markers. But as far as I can tell the meaning is not standardized, but rather is by agreement between the ground and aircraft users. There may be some standardized meanings and if you know of them please let me know. This is a single piece of cloth with edges that have no seam. 1.7 ounces and about 40" x 40". Probably based on the idea of MIL-P-43743, but should have a label and the cut ends should be fused, so this may be a modern unoffficial copy. This may be an early version of the VS-17? 2' x 6' . One side is fluorescent orange, sometimes referred to as international orange, and the other side is cerise, commonly referred to as red. It has six tie-down points used to attach the panel to stakes. It also has three snap fasteners on the short ends in the stow pocket. It should be folded up so that the olive drab green is showing. The color of the panel used should be the one that best contrasts with the surrounding area. Note there is a "civilian" VS-17 but it does not have any eyelets. 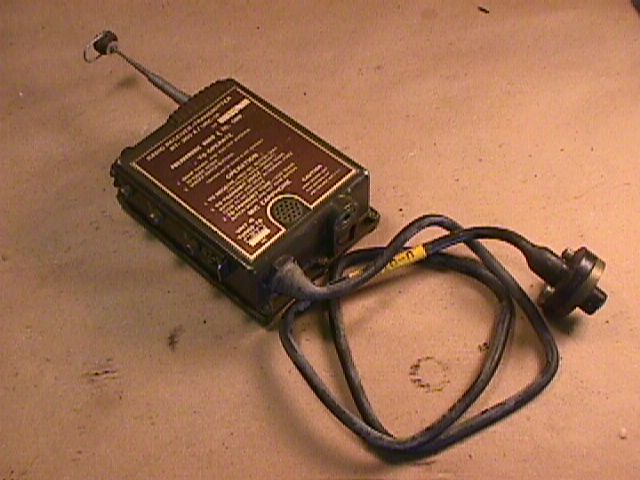 Uses two like kind PRC-90, -103, -106 radios with their antennas replaced with connectors on the test set. This is a patented by ACR set that places the antenna in an RFI tight box and the antenna thinks it's talking to/from free space, but no signal is transmitted, thus not setting off a false alarm. For testing survival radio batteries and also the survival strobe light SDU-5/E battery. 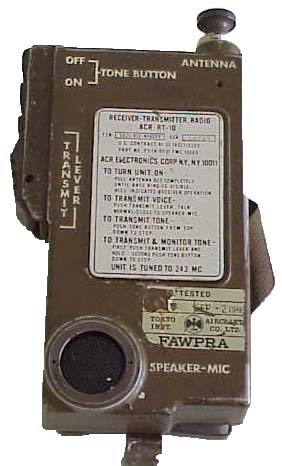 TS-884/PRM-30 used with the RT-159/URC-4. Has cable to connect to the battery and a similar cable to connect to the radio, plus a coax probe. Basic needs in order: air, water, food, shelter, sanitation. There are a number of ways of purifying drinking water (Wiki). Just a list, haven't studied or found current versions. [an error occurred while processing this directive] page created 11 June 2001.